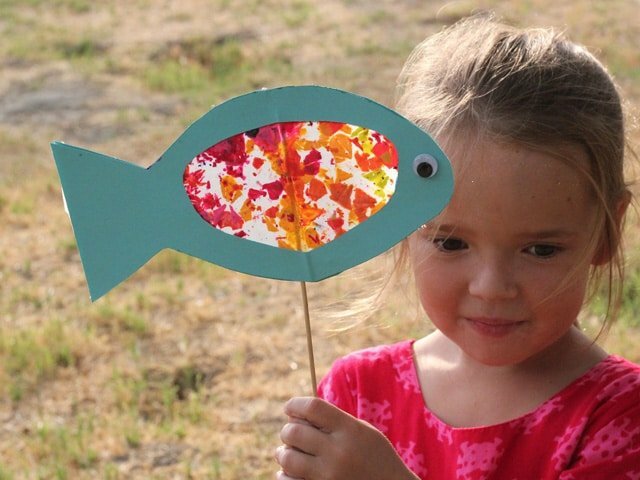 Since the fish is an important symbol for Rosh Hashanah, my daughter and I decided to make a Stained Glass Fish for the High Holidays! We always have a lot of old crayons around just waiting to be repurposed into something more meaningful like this. 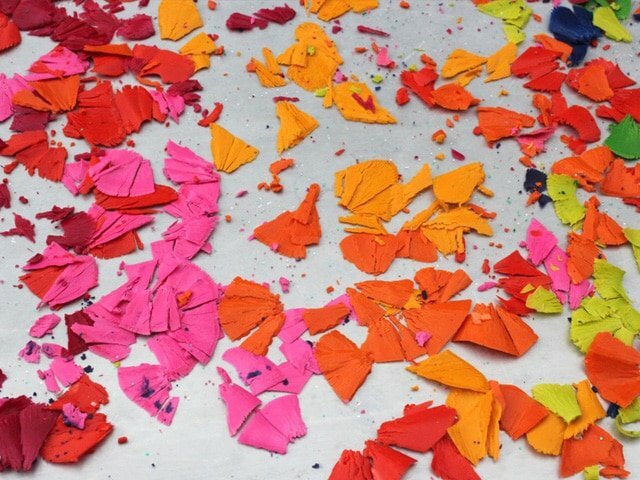 So we gathered our old crayons together, peeled off the paper and shaved them onto a big sheet of wax paper. We worked on a cookie sheet but any surface will do. We arranged the shavings into pretty stripes (more or less). 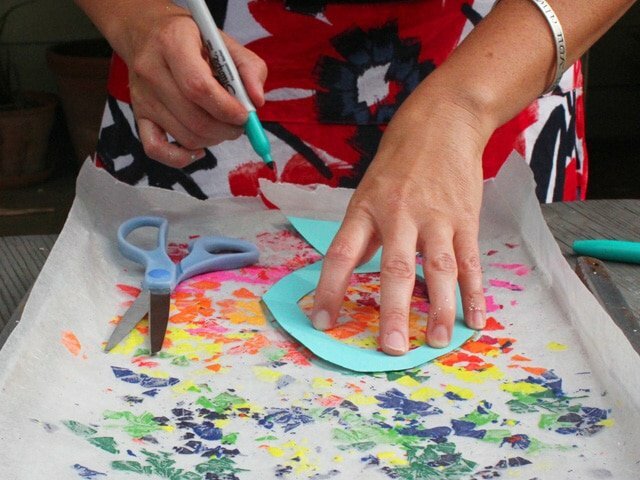 Next we put down another sheet of wax paper over top of the crayon shavings and then a dish towel on top of that. I ironed the whole thing on medium heat for about twenty seconds or just long enough for the wax paper to fuse together with the crayon. 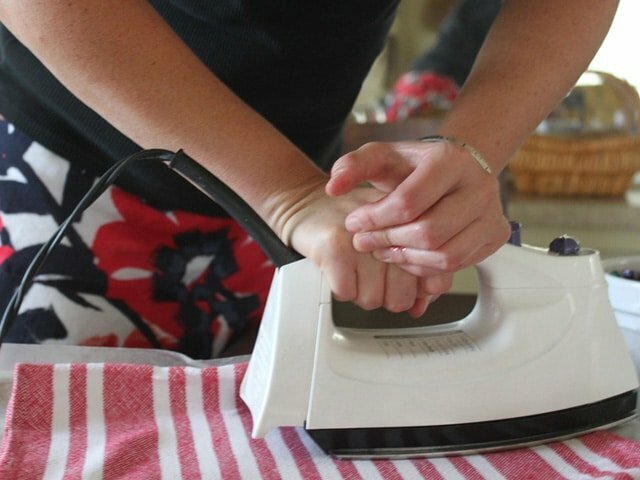 Some places had to be ironed more than others. 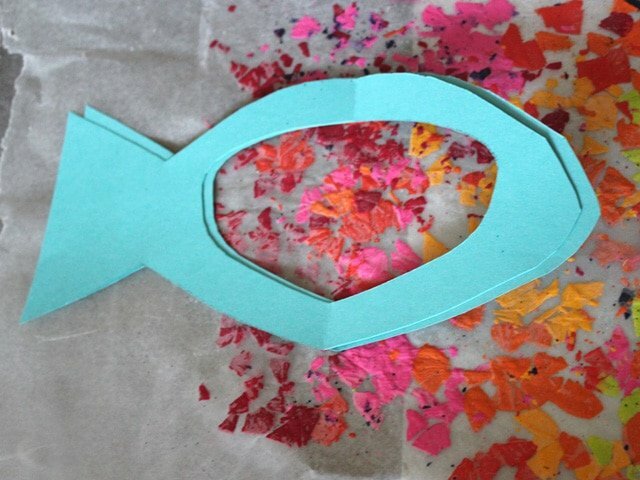 Once our wax paper shaving art was good and fused, we set to work creating the fish’s body. This is really easy. Take two sheets of 8.5×11 card stock or construction paper (we used blue) and fold them in half. 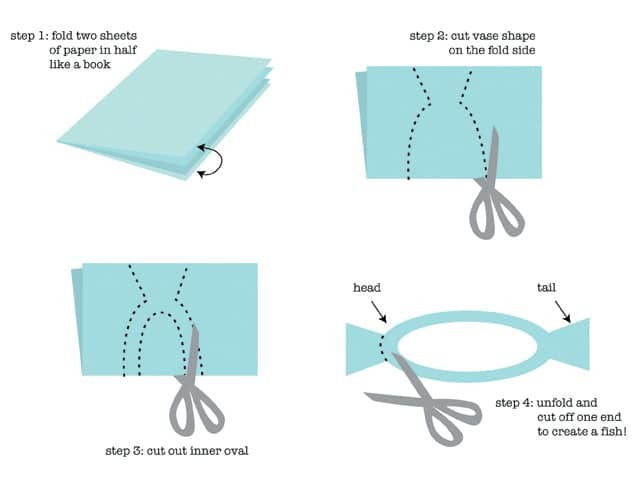 When it’s folded, cut a vase shape on the fold as shown above. Then cut a half oval out of the middle to create the fish’s belly. Once you open the folded fish, you can then cut off the extra tail, making one side it’s head! Now you’ll have two fishes, one for each side. Don’t worry about the fold in the middle, It’s just a little bend that makes the fish look like he’s swimming. Next I laid the fishes body on our wax paper-crayon art and traced around it’s body. 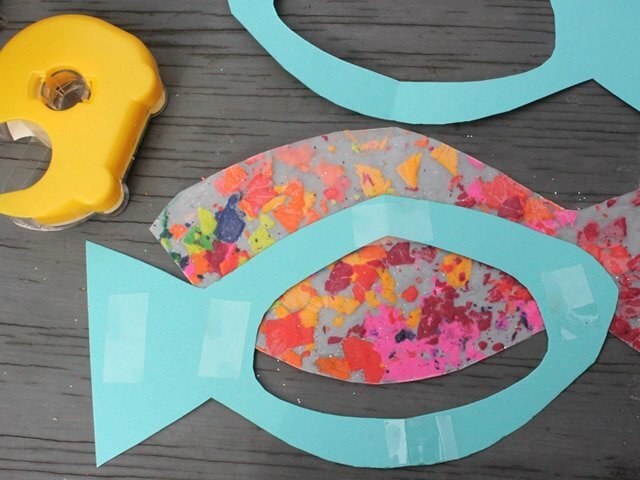 Then I cut out the fish shape. I used double-sided tape to attach the frame to the wax paper art but any kind of craft glue would work. Just place one frame on each side, glue or tape together, and you’re done! 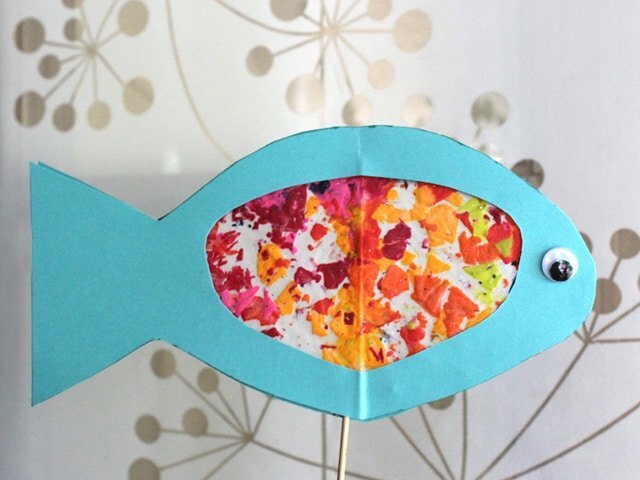 Attach googly eyes or beads for the fish’s eyes, or you can just draw the eyes on. 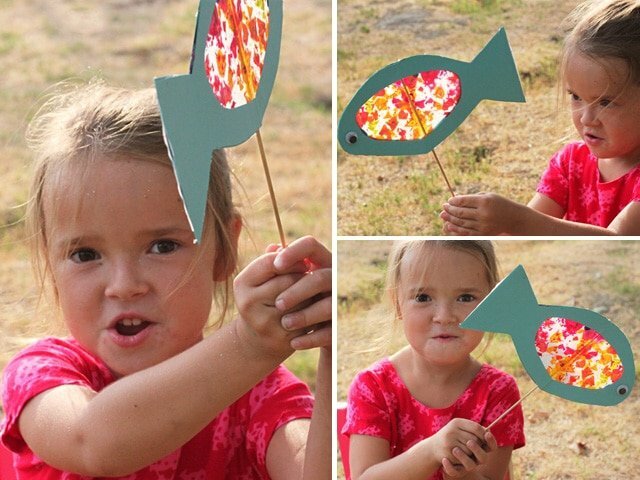 We put a shish kebab skewer in the middle of ours so my daughter could use her fish as a puppet. I cut off the pointy end of the stick so it wouldn’t be sharp. The rest was just fun! Sound effects not included. If you are not familiar with Judaism, this What is Rosh Hashanah page will help you explain Rosh Hashanah to your child. It also explains why fish are an important symbol in the Jewish New Year tradition. Wonderful idea. Have you made these with cookie dough and life saver candies for a school project? Is there anything that isn’t made better with crayons? I swear crayons make the world go’round. Very cute craft! I love this idea! Bug is so cute. This is a cute project. I think I’ll have my kids make these this weekend since it’s suppose to rain all weekend! These are so cute! We made some this afternoon. 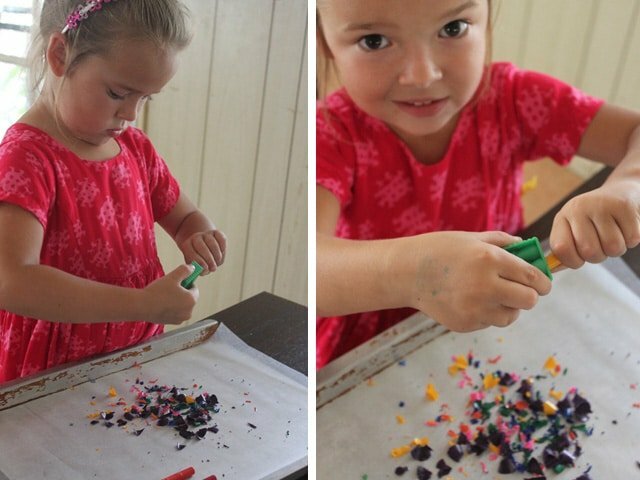 Thanks for a fun and easy craft idea! Cute little craft 🙂 I may have to do this one w/ my little girl one day.